•	4 pieces of quince. •	4 pieces of pomegranate. •	2 tablespoons of pomegranate molasses. •	1 kg of lamb meat minced into pieces. •	2 cans of tomato paste. 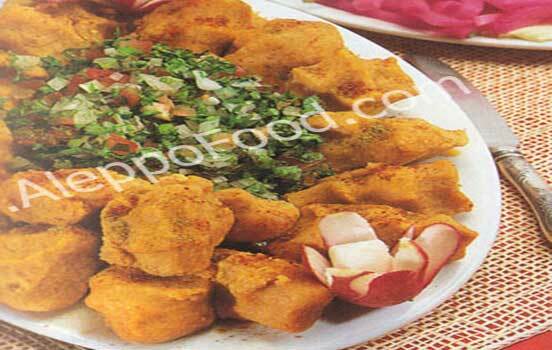 •	Kubba, rounded and stuffed with fried meat, pine and walnut. •	5 pieces of crashed garlic with dried mint. •	Boil meat with spices until they become cooked, then add tomato paste to it, then leave it until it become thick, then add pomegranate juice to it and a little of pomegranate molasses. When the soup becomes thick, add chopped into slices quince and leave it to be well cooked. •	In another pot, boil kebbeh a little with water and salt, then raise it from water and add it on the meat plate , and then boil it with the mix for 10 minutes, then put the crashed garlic with mint on the suface.